3 Comments on Is “Penal” A Dirty Word? I’m sorry, but I cannot say, think, or write that word without repressing a giggle. That’s probably because I have the maturity level of a 13-year-old boy and it sounds too much like “penile” (FYI, DO NOT google “penal vs penile”. It’s not pretty). If pundits and politicians ever start referring to reforms in the correctional system as “penal enhancement”, it’ll be all over for me. While the preceding may be worthy of a chuckle, it doesn’t answer the question posed in the title: Is “penal” a dirty word? The answer is yes, but not the way you’re thinking. That last statement could probably use a little clarification, so let’s say that I think it’s a dirty word when used in connection with Jesus. In that context, i. e. penal substitutionary atonement, it paints a picture of a God consumed with “justice”. And, by “justice” I mean “harsh, merciless punishment”. To be perfectly honest, that’s really not a God I’m interested in. While PSA and the vision of a God just itching to punish sinners isn’t the newest atonement theory, neither is it the oldest. That honor goes to the Ransom theory, followed closely by the Christus Victor model. Penal substitution, on the other hand, didn’t come up until a thousand years later, when Anselm of Canterbury proposed it. The concept really took off when John Calvin latched onto it, combining it with his other ideas about election and predestination. But, it wasn’t until Jonathon Edwards, “America’s last Puritan”, preached a heart-warming little homily called “Sinners In The Hands Of An Angry God” that the doctrine caught on here in America. That sermon ,given during the First Great Awakening which Edwards helped usher in, changed the way Americans thought about God. The truth is, outside of New England, Americans didn’t think much about God at all. Whether changing that (lack of an) approach to the divine was a good thing or not, the image of God presented by Edwards falls on the “not” side of the argument in my opinion. Mostly because the god Edwards describes sounds more like a sadistic child burning ants with a magnifying glass or pulling the limbs off a grandaddy long legs than the loving, forgiving deity I believe in. It makes God sound like psychopath See above statement about ants, spiders and magnifying glasses. It limits God’s power While you might not believe God is omnipotent, the majority of people who hold this idea of atonement do. Which doesn’t a lot of make sense, because it says that God required justice (aka blood sacrifice) in order to forgive the sins of humanity. Just how omnipotent are you if you’re required to do something? It’s not “good news” In essence, PSA says that we are so vile and disgusting in God’s eyes that God couldn’t stand the sight of (much less forgive) us until an appropriate price had been paid. Not only that, but if we don’t acknowledge that price and accept the “grace” offered, we must suffer eternal torment. How is that good news? It’s too easy The truth is, penal substitution is a way to avoid the hard work of following Christ. Think about for a minute; instead of following Jesus by loving your neighbor and your enemy, feeding the hungry, caring for the poor, etc, all you have to do is say a prayer and believe that God punished Jesus for all the bad things you’ve ever done/or will do and you’re golden. To me, that makes a mockery of the Cross and everything it stands for. 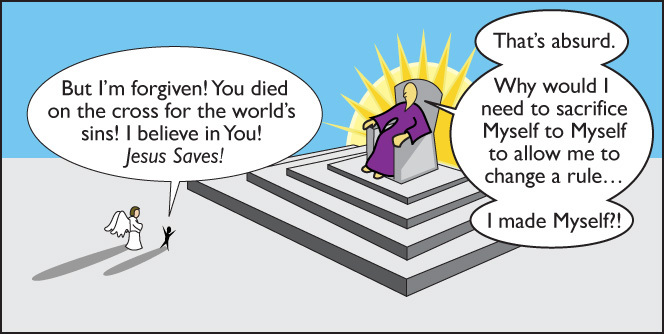 Since I’ve spent almost 600 words telling you why I think penal substitution gets atonement wrong, I suppose a good way to end this is to tell you which view gets it right. Leaving aside the idea that this all just “whistling in the dark” (and it could very well be), I have to say I’m drawn to both the Christus Victor and moral influence theories. I like Christus Victor because it says that death is not the end, that life continues no matter what (sure, not for the dead person, but you know what I mean). The moral influence idea appeals to me because it fits with Jesus’ work while he was here on Earth. Conceived by Peter Abelard, it teaches that Jesus’ reason for being was to bring about a positive moral change in humanity and that his death was intended to impress us with the depth of God’s love, i. e. God loved us enough to suffer a terrible death to show us a new way to live. For me, that’s a God worth believing in.